Consequently, despite the last decade’s improvements on several fronts (written and video instruction, more hands-on courses, and a greater diversity of equipment offered via mail order), the lack of mowing success is still a too-common occurrence. An individual’s theoretical preparedness, gained by a thorough study of information in print to date, would no doubt reduce the incidence of disappointment. Yes, much more could be explained and presented to the public in a better-organized format — and this document is a continuation of our work in that direction. My conservative guess is that within the last few decades, at least 50% of the units referred to as “The Austrian Scythe” sold in North America were “maladjusted” when purchased–and many of them unfortunately remain so. The way I use the term “maladjusted” here is primarily with reference to snath/blade disharmony — and secondarily the most basic bodily comfort (i.e. upright posture) of the mower. The concept of snath ergonomy per se — which addresses the finer points of comfort and thus also efficiency — is left out of this discussion. 1) The blade is not hafted well on its snath. 2) The blade does not lay well. For more detailed discussion and photos, please see Snath and Blade Fitting. It must first be pointed out that a “well hafted” scythe is relative; what hafting arrangement works well on certain snath/blade combinations, under certain cutting conditions or in a specific mowing style (i.e. pattern of the cutting stroke) may not be acceptable by experienced mowers from another region with their own traditions and resulting set of parameters. a) most of the Alpine meadows are far from dense and they were cut regularly at full bloom when still relatively young. b) the typical Austrian stroke pattern is very semicircular (as opposed to a more sideways execution of the cut, characteristic of the Eastern cultures, and even more so in the Basque region of Spain). c) the blade edges were kept thinly peened and well honed — meaning in utmost easy-cutting condition! A sharp blade, of course, was assumed in all agrarian cultures. Still, in many parts of Europe a blade hafted “in circle” would not be satisfactory because the grass grew denser (than, for instance, throughout the Alps) and/or the cutting stroke was less circular. When speaking of “correct” hafting angle, further qualification is in order. For the mowing of a lawn, a blade “in circle” may well be preferred because it will cover the maximum surface expected of one scything stroke and thereby result in a stubble with fewer “steps” or ridges. Its lay and the horizontal balance, however, should be just right and certainly the edge needs to be in tip-top condition. Given the same mowing style, a blade the point of which is closer to the end of the snath than its beard (i.e. it is more “closed” or more acutely hafted) will cut less grass at a stroke but always pulls through the cut easier. 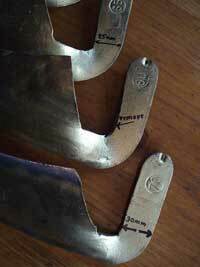 Beginners are more likely to obtain satisfactory results if their blades are a little too acutely hafted than if a little too open. My son has a small sustainable agricultural farm in the Blue Ridge Mountains of Virginia. We started using an American scythe but were unsatisfied with it, especially after relatives from Switzerland visited and commented on the weight and the difficulty using it. I ordered a 24″ scythe with a snath for my wife who is 5′ 0″ and a 26″ blade with a snath to fit my son and me. We have been very pleased with both of these scythes. After reading The Scythe Book and your Blade Selection chapter I ordered a 22″ and a 32″ scythe. The 22″ works well for us but both my son and I have difficulty using the 32″ scythe. We thought that the 32″ scythe would help us cut a large area more quickly and easily. Unfortunately that is not so. The tip often digs into the ground. We do much better and work much faster with the 26″. Do you have any suggestions? Do you hold the snath differently or use a different swing? We would like to become more efficient and use the scythe more and would therefore appreciate some help. Although an inquiry along these lines justifies a prompt response, we had left this one un-responded-to at the time simply because Ralph provided no phone number. After our bold-printed plea that technical questions be accompanied by a phone number and many weeks of sending back reminders to that effect, we had finally decided to ignore all those who ignored our plea (which did include an explanation of our farm-based kitchen-table operation and no paid secretary on staff). 1. I assume you have a “grass” blade from Scythe Supply (because the rest of the North American sources do not sell 32″ blades). I know that only a few models of this basic pattern (referred to as the 201 form) allow what I consider a “nice haft” — and the one Scythe Supply carries is not among them. This is why your long blade is probably not hafted acutely enough for the work you expect it to do. The shorter blade (of the same model), while having the same predisposition, is more forgiving. With other words, you have learned to get by with it possibly not realizing that it also functions below a 65cm scythe blade’s potential in your situation. The longer blade makes the “shortcomings” beyond your present ability to compensate, and thereby more troublesome or obvious. 2. A fine edge is, in itself, a partial compensation for all sorts of scythe’s other ailments. Giving this aspect of your mowing experience more attention will undoubtedly reduce the degree of your present troubles. Grind or file approximately one-eighth of an inch (up to one quarter inch is still rather safe) from the front of the tang (in the area where the tang touches the ring) so as to be able to set the blade’s point lower. Try to achieve a setting where the point of the blade is three to four inches closer to the upper end of the snath than its beard. I assume you have the 40mm x 40mm ring (which is a little wider than the snath). The design of that particular ring may not readily hold the longer blade all the way forward (as it should be in your case!) — whenever you stress it.Support it with a wedge/spacer from behind so it cannot move backward during demanding use. Keep whetting that blade more often and better than you now think “should be necessary”. And if the bevel angle is poorly suited to the task at hand, whetting can only help so much… In that case, re-beveling (by peening, filing or grinding) is in order. Of course, if you have read the sharpening instructions on this website, you already know all that. Make a better snath. Even the one-grip model, if the blade-fitting instructions are followed, will immediately remedy some of your dilemma and the 90cm blade will feel more balanced in your hands. Refer to Blade Fitting. This is an abbreviated response. On the phone I can provide much more explanation, ask additional questions to clarify matters, and respond on the spot. Thus, in relation to how much time it takes to do all this via e-mail, I still consider the phone “king of efficiency”! While the cases of a) are more prevalent, I consider them a lesser evil with respect to this discussion because even the least perceptive of novices will instinctively compensate by bending over. The strain on the back notwithstanding, the blade may then cut with relative ease. The cases of “edge too low” are less readily recognized and the tool is consequently used without appropriate compensating on the spot (i.e. lifting arms). In instances of some blade models, especially if used by tall people (and even more so if they are mounted on a straight snath) the recipe above may not be enough. The blade’s tang itself can, of course, be “lifted” — which is what all village blacksmiths did for centuries in order to “lay” the blades just right for their new owners. Depending on the thickness and hardness of the tangs, a certain amount of this (up to five degrees) can also be done without heat. Whether hot or cold, this alteration may be beyond the ready ability of most of today’s scythe owners. As long as the present system of commerce still functions, obtaining a blade with a steeper tang might be the simplest solution. A still more meaningful option, in my opinion, is to make yourself a different snath. You will then have accomplished two things: Gained knowledge and skill which can be passed on to other people who need it, and (hopefully) ended up with a snath of fundamentally better design. Because the precise opposite of this was (and still is) typically the case with American scythes, folks tend to be glad when that blade actually lays with its edge aligned with the ground — without the user having to bend over! Well, positioned that way, it does cut. It requires more frequent sharpening, however, and it does not take much of the edge’s excessive aim downward before a blade “drags like a bobcat by the tail” — and the person expends more energy than should be needed. This is inefficient and an abusive way to treat the mower as well as the tool. The two bush blade models presently imported by Scythe Supply and Marugg are prime candidates for this scenario. Their tang is so steep that only in rare cases do they function well on the snath with two grips facing the mower (the very type of snaths sold by these two companies). The rare cases are of very tall people — and even then the snath should not be curved at its bottom end. It is well worth for may of you out there, especially short to medium height folks who are using a curved snath with a grass blade (either blade or snath purchased from Scythe Supply, Marugg, or Lehman), to try this arrangement. For the average “weed” cutting or even more so with very tall vegetation — whether you have the so-called grass or ditch blade — you may find that they suddenly pull easier. To achieve good lay of one of the bush blades mentioned above, using a wedge may not be enough. The simplest solution for those already owning one of them is to make the one-grip straight snath — or a more complicated two-grip “recurved” design. Well, in my long-standing opinion, most scythes sold by mail order are poorly balanced. In The Scythe Must Dance (2001) a brief explanation and a helpful hint can be found regarding the snath’s weight distribution. In snath/blade fitting we address the concept of the blade’s “horizontal balance”. See also “Improving Snath Ergonomics”. Concerning instructions per se, more words have been written on the subject of sharpening than on any other single aspect of scythe use — and rightly so, because an easy-cutting edge is the very heart of this tool’s potential efficiency. However, no single version of sharpening instructions is, in my opinion, complete enough or so clear that still another attempt at seriously improving upon it all could not be justified. Interim it is not easy for beginners to sort the humbug from the useful bits. I mourn all the confusion in this regard because I know that most of them are working with edges considerably below par. 1. Because a blade’s edge was peened or “finished” in the factory does not mean (even if the label says so) it is really ready to use. As a rule a new blade requires treatment beyond the mere honing with a whetstone. 3. When beginners peen their blades by means of the jig, they often neglect the follow-up step — which is the re-shaping of the outermost fraction of the edge so that no reflection is seen on it when the blade is viewededge-on in good light. This requires a few firm strokes with a synthetic stone or a gentle touch with a smooth file. Natural stones are poorly suited for this job — but they should follow as the next step before heading to the field. (For more details see Peening with the Jig. 4. Alone the fact that someone goes through the motion of whetting the blade does not necessarily result in a “well-honed edge”. Whenever, after the periodic (every five minutes or so) in-field whetting, you take the first stroke, the feeling should be, “Ahh, how nice.” If this is not the case, stop and whet again before continuing to mow with what will progressively become a duller and duller edge. sparse mature vegetation of resilient grasses (sometimes with a high content of silica). areas containing “thatch”. Thatch is a layer of uncut dead vegetation from previous season/s or vegetation which was cut with a machine but not removed. The upper and partly upright-standing layer may be a scant or a mighty one. In both instances, it is the understory of thatch that calls for additional consideration. Similar to the case of “universally perfect” hafting angle, lifting a blade into the air between strokes is not fundamentally “wrong”. It is indeed a regional custom in some areas of Austria and Switzerland, for example. But again, it hinges on several other aspects of those people’s traditional mowing technique; for them it works. It is, however, a more difficult technique to master — and it does not make best use of the human body’s potential dynamics, especially so if a person is not excessively strong. It is for this reason that I have advocated a fundamentally different technique — namely the sideways shifting of the body weight. Most people I have worked with in Europe (including the founding members of the Scythe Association of Austria) have noted the merits of this tai-chi style movement — and this is what we teach on the hands-on courses. The lifting of the blade (which, admittedly, gives it more momentum) does not mix well with the sideways shift; anyone paying attention to the energy patterns while mowing this way will quickly come to the same conclusion. The lifting of a blade technique requires an accurate horizontal re-alignment of the blade with the ground surface with each new stroke. Beginners especially have difficulty doing so — which is why the stubble of those with that tendency is always less even than those who learn to keep the blade down quicker, Besides,slightly hugging the ground surface with the centre of the underside of the blade nearly always prevents digging the point into the earth! I have experienced this with people from at least a dozen distinct ethnic backgrounds and on both sides of the Atlantic. Perhaps we are witnessing a genetic trait with roots to the period of the Neanderthals, who in a similar manner lifted a club to finish off their prey in order to procure a meal. The contemporary scythe students, however, arrive at the course with breakfast already in their tummies. They claim to be paying attention and wanting to learn to mow, not hunt. So what are we to make of it? Or, to be more specific, how can we break the spell of that archaic prey-clubbing instinct?? A third tendency, while learning, is not finishing the stroke to the extreme left. As a result, some vegetation remains uncut in that area or at least not cut as low as the stuff in the middle of the blade’s path.